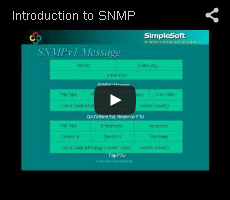 SimpleSnmpProxy is an easy to deploy, software solution that provides protocol translation between various versions of SNMP allowing an SNMPv1 NMS to manage a SNMPv2c or v3 device or a SNMPv3 application to manage a SNMPv1 device. In addition, it securely provides management visibility to the resources within cordoned-off zones like the DMZ. This allows your existing NMS to be leveraged to manage devices with unsupported SNMP versions and critical resources like eCommerce servers within the DMZ, without compromising security. SimpleMIBBrowser is an easy to use, graphical SNMP application that can query and configure management information from any SNMP enabled device. It supports all versions of SNMP and can send all types of SNMP requests (Get/Getnext/GetBulk/Set). Configuration data retrieved from one device, or manually created, can be stored and propogated on many devices. Performance management data can also be retrieved and plotted by conducting periodic polling. Fault management information can be received using SNMP Trap/Inform mechanisms. Debug tracing of requests and responses also makes it useful for trouble shooting and resolving communication problems.